Place pistol in a uncluttered area. Remove the magazine and ensure that the chamber is empty. Lock the slide rearward and manually engage slide stop. Pull the trigger guard downwards to open. Step #4 Lift the barrel assembly off of the frame and set it aside. Cleaning or inspection can be conducted on the barrel assembly independently from the rest of the pistol. A breech inserted cleaning rod or deep chamber cleaning is best accomplished at this time. Pull slide fully rearward and then lift the rear of slide off of the frame. Step #6 The slide assembly is now moved forward to separate it from the frame.The pistol is now separated into it's three main components - barrel, frame, and slide. Pull slide fully rearward on frame and then seat the rear of slide downward. Lock slide open using the slide lock lever. Install barrel onto the frame. Close the trigger guard to lock barrel in place. Cycle the slide a few times to test reassembly. Step #1 On the right side of the slide, locate the crosspin and drift it left with a non-marring punch. Step #2 Drift the crosspin completely out of the slide assembly. With the crosspin removed the firing pin and spring will drop out of the bottom of the slide. Step #3 Use a non-marring punch to drift the bolt assembly forward, out of the slide. Step #4 Once the extractor claw clears the slot, the bolt assembly can be removed from the slide. Step #5 Once the bolt is removed from the slide, the extractor claw can be removed. Step #6 The extractor plunger and plunger spring can be removed from the slide slot. Step #7 The bolt assembly consists of the following components - firing pin and return spring, extractor plunger and spring, extractor hook, bolt housing, and crosspin (also serves as the firing pin stop). Step #8 To reassemble the slide. First install the extractor spring and plunger. Step #9 Place extractor hook onto the bolt housing. Step #10 Carefully slide the bolt housing and extractor into the slide. Once seated, place the crosspin in the left side of slide to keep the bolt held in place. Take care to ensure the grooved end of crosspin is positioned outward. Step #11 Turn slide assembly over, place firing pin and spring into the bolt with the groove facing upwards. Step #12 Use a tool to push in the firing pin, push in the crosspin to lock the firing pin in place. Step #13 Use a non-marring punch to seat the crosspin into the slide until it sits flush with the side of the slide. Slide reassembly is complete. Step #1 First field strip the pistol as described above. Then loctate the trigger pivot pin. The pivot pin must be drifted from the right towards the left side of the frame. It only has to be drifted part way to adjust the trigger pull on the Model 41. Step #2 The trigger adjustment lever is located inside the frame. Drifting the trigger pivot pin approximately half way across the frame will allow clearance for adjustment lever movement. Step #3 Lay some masking tape onto the right side of the frame to prevent any surface marring from tool slippage. Step #4 Use a 3/32" pin punch to drift the pivot pin. Step #5 Drift the trigger pivot pin part way into the frame. Step #6 Ensure the trigger pivot pin is clear of the adjustment lever. Step #7 Adjustments can be made by moving the lever forwards or rearwards in the frame. Each lever graduation is approximately 1/4 pound of adjustment. The trigger can be adjusted between 2 - 3 pounds by selecting an appropriate lever position. Step #8 Once the desired lever position is selected, drift pin to right far enough to test the trigger pull. Make more adjustments as necessary by moving the pin and lever. Step #9 Once desired pull weight is achieved, drift the trigger pivot pin to the right until the pin is flush with the left side of the frame. Reassemble pistol and test accordingly by live firing. This procedure was first developed to help reduce S&W Model 41 ejection problems by the late pistolsmith Austin Behlert. Remove the slide from the pistol by field stripping. Test the extractor’s holding capability by placing a round under the hook on flush on the bolt face. Gently shake the slide back and forth. If the case falls off, then the extractor is not to holding the cases securely against the bolt face. The extractor can be tuned by using the following steps. Remove the extractor hook from the bolt assembly by following the slide disassembly directions above. Place the extractor hook in a drill press vise. Tighten the vise jaws down just enough to put a slight bend (or bow) in the back side of the extractor hook – a few thousandths of an inch is all you’re trying to accomplish by this process. Caution – over tightening the vise jaws will break the M-41 extractor! Use a pointed pin punch and tap it lightly with a hammer, in a stippling action, to make small dimples along the back side of the extractor. These dimples relieve the strain on the hardened steel and allow the extractor to conform to the new shape without having to re-heat treat it. Next lightly file the roughened dimples to smooth out the extractor’s surface. Filing the extractor surface allows it to move smoothly when inside the slide’s extractor slot. Re-blue the extractor after filing and replace it in the bolt. Retest the newly tightened extractor hook by the round placement method. Reinstall the slide onto the pistol. Extractor tuning adjustment is complete. Time to go out and live fire the pistol to test extractor operation. The trigger bar is forced downwards by the magazine disconnector lever when a magazine in not installed. The magazine disconnector lever is spring loaded to push downwards. When the trigger bar is down the sear is disengaged, and the hammer cannot be released by an operator pulling the trigger. The top (curved shark fin) portion of the trigger bar also has a disconnector function. 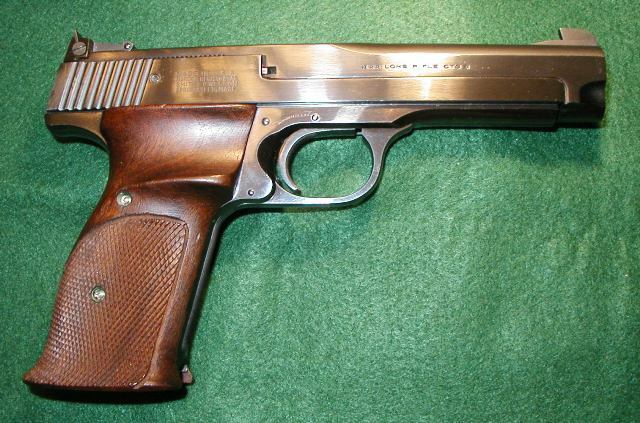 When the slide is out of battery the fin is forced downward by the slide, this disconnects the sear and prevents the pistol from being discharged. The trigger bar is forced upwards when a magazine is installed. The magazine disconnector lever is pushed upwards by the trigger bar return spring. When the trigger bar is up, the sear is now engaged by it and the hammer can be released by an operator pulling the trigger. The top (curved shark fin) portion of the trigger bar is now aligned with the cut-out recess in the slide. When the slide is closed it's in battery, this allows the sear to be engaged by the trigger bar and the pistol can be discharged.